Circumstances: Maria, who was a student nurse at Dudley Road Hospital in Birmingham, went missing aged 17 years old in 1968. Two new age progressed images have now been produced which show how she may have looked aged 17 years old and aged 59 years old. She was last seen sometime between February and June 1968. It was asssumed at the time she had just run away from the Old Hulme nurses training centre which is where she lived whilst working at the hospital, which is now known as City Hospital. Maria lived in Kidderminster with her family before she moved to Birmingham to work. When Maria was last seen she was described as medium build, 5'5 tall with light brown short wavy hair, brown eyes and wore glasses. If you have any information about what happened to Maria or you knew her when she worked at Dudley Road Hospital or when she lived at Old Hulme, please contact the Missing Persons Bureau on 0808-100 8777 or e-mail us - missingpersonsbureau@npia.pnn.police.uk. Add a commentRecommend DETECTIVES have re-opened the investigation into the 40-year-old mystery of what happened to a student nurse who vanished from Birmingham without trace. Maria Bernadette Aldridge was aged just 17 when she disappeared while studying nursing in Birmingham in the summer of 1968. No trace of her has ever been found and now a fresh investigation has been launched. The teenager, originally from Stourport, Worcestershire, was staying in the Old Home Nursing Home at the old Dudley Road Hospital, now called City Hospital, where she was second year cadet nurse. Her family were alerted when Maria’s boyfriend, believed to be Paul Gough, travelled to their home in Stourport looking for Maria. When Maria’s worried mum, Mary O’Sullivan, and her sister went to the hospital dormitory in search of her, the resident matron stated she was no longer there and handed them all of her belongings. She had even reported her daughter’s disappearance to police on the Fred and Rose West inquiry in the 1990s but checks against the grisly remains drew a blank. The case was re-opened by police a few months ago after a review of an inquiry into a headless female body found in Norfolk made checks against her name and it was passed to detectives at Rose Road CID for fresh investigation. 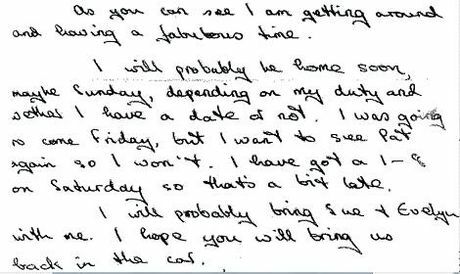 They discovered a letter from Maria to her mother dated February 28, 1968 in which she wrote of her experiences in Birmingham, including nights out at the old Locarno nightclub, then in Hurst Street, in the city centre. In the letter she also referred to a number of friends, including two believed to be student nurses, called Sue and Evelyn, and others named Dave Olfrey, Patrick McGill, Christopher Fair and Jim Taylor. Police appealed for them, and the teenager’s former boyfriend, to come forward in the hope that they might be able to shed some light on her disappearance. Det Insp Ian Bulloch said: “We just don’t know what happened to her. It’s a 40-year-old mystery, as if she dropped off the face of the earth under that name. Det Insp Bulloch said the mystery leant itself to any number of different theories, ranging from her being killed to breaking contact with the family for personal reasons that she thought would bring shame upon them or herself. Officers have also written to everyone in the country named Maria Aldridge and added if she was still alive and wanted to keep her privacy, they would treat calls in confidence. Last month, Maria’s sister Cathy, now aged 57 and living in Canada, said: “We were convinced she would just turn up and then the days, weeks and months passed. Anyone with information should call police on the Rose Road protracted inquiries unit on 0121 626 5967 or 0845 113 5000 ext 7863 6254. Missing Maria Aldridge - Were You In Birmingham England in 1968? Description:Were you in Birmingham, England, in 1968? If so, or you know anyone who was, you may be able to help us. Maria lived with her family in Stourport. She attended Kiddermister High School then went on to commence Nurse Training at the Dudley Road Hospital (now known as City Hospital, Birmingham). She was resident at the Old Home Nurses Residence. Maria stayed in touch with the family only by postal correspondence, so it is not clear exactly when she went missing. At this point, we can pin it down to the summer months of 1968. At the time, it was thought she was a runaway, however, she took none of her belongings and her sister recalls that at the time, it was known that she had not picked up her latest pay check. 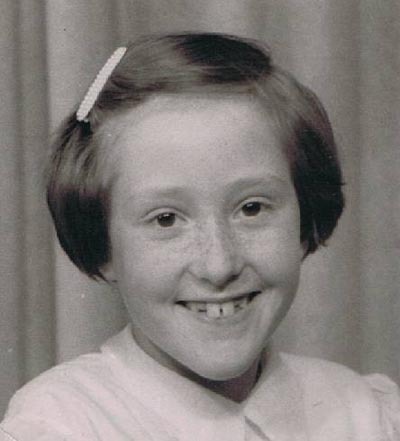 We are asking for anyone who went to school at Kidderminster High, leaving in 1966, or who worked at Dudley Road Hospital, to please contact us if you recall Maria, or anyone going missing. What may seem insignificant to you, may be important to us in helping to piece together the puzzle of her disappearance. We will be updating the site with newer photo’s as we get them. At the time of her disappearance, Maria was 5 foot 5 inches, had brown hair, brown eyes and wore glasses. She was 17 at age of disappearance. A MYSTERY personal ad in the Birmingham Mail more than 40 years ago could solve the riddle of what happened to a student nurse who vanished without trace, it was revealed today. Detectives hope the tantalising clue could provide a breakthrough into the disappearance of Maria Bernadette Aldridge in the summer of 1968. 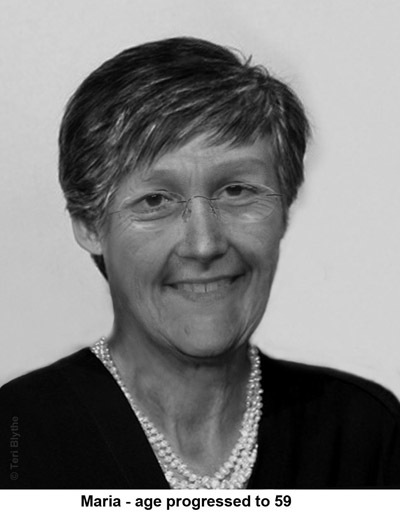 Officers today also released an image compiled by a forensic artist that predicts how she may have aged over the past 40 years. Maria was aged just 17 when she disappeared while studying nursing in Birmingham. No trace has ever been found of her and a fresh investigation was opened earlier this year. At the time the teenager, from Stourport, was a second year cadet nurse at the Old Home Nursing Home at the old Dudley Road Hospital, now City Hospital. Records show Maria was working until at least May and police think she may have gone missing around that time. Detectives have now uncovered an ad in the Mail on June 1. 1968. Det Sgt Ian Bulloch said that while it is not clear whether it was meant for Maria, they were now trying to trace the person who placed it in the hope they could help the investigation or eliminate it from their inquires. He also hopes age progression images will help. 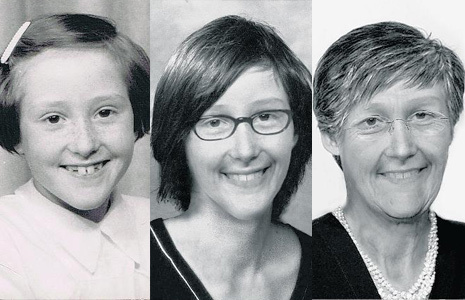 While the hair and glasses may be different, they offer possible likenesses of how Maria looked later in life and may now look aged 59. “We need to trace people who may have known Maria at the time or who recognise a lady of the likeness in the age progression image,” he said. Police are also still trying to trace Maria’s boyfriend at the time, believed to be either Paul or John Gough, who alerted her family that she was missing. Officers have traced a number of people who were cadet nurses alongside Maria in 1968 and are now writing to 82 people listed on the hospital’s book at the time. Det Sgt Bulloch said: “We just don’t know what happened to her. It’s a 40-year-old mystery. The family can’t get any closure until they know what happened. Maria’s mother, Mary O’Sullivan, spent almost 40 years desperately hoping she would come home but died three years ago not knowing what happened to her. THE sister of a student nurse who vanished without a trace more than 40 years ago has made a poignant return to Birmingham to visit time her last known residence. Maria Bernadette Aldridge was aged just 17 when she disappeared while training at the old Dudley Road Hospital in the summer of 1968. No trace of her has been found and a fresh inquiry into her mysterious disappearance is underway. Her younger sister Cathy Phillips travelled from Canada to visit the Old Home Nursing Home, where her sister was living as a cadet nurse, in the hope of keeping her sister’s memory alive. Her visit came as police named a man they were trying to trace. Revealing four decades of heartache, mum-of-five Cathy, aged 57, now living in Toronto, said: “I have had a wonderful life but there has always been part of me missing. “There is a hole in my heart where Maria was. Records show the teenager was studying at the hospital until at least May 1968. Her family were alerted when Maria’s boyfriend travelled to their home in Stourport, Worcestershire, looking for Maria.